Over 4,100 finished square feet if you include the finished, insulated, heated and air conditioned sun room. A Fourth bedroom is easily created by adding a closet (to the room in the lower level that is currently used as a guest bedroom). If you love to watch the seasons change and wildlife abound, this house is your place. Quality built with 6 inch walls and premium cellulose insulation, supplemental radiant heating, large first floor master suite with full-body shower and steam generator and a large soaking tub. Featuring large rear windows, the morning sunrises affords spectacular uninterrupted views of the natural watershed, Sloan Pond. 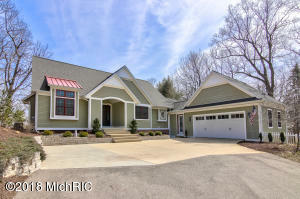 This home is situated a walk away from Lake Michigan access at Kouw Park. A very private setting, yet the bike trail is right outside your door. The Kitchen is a chef's delight with a large granite center island and serving peninsula. Enjoy entertaining on the insulated air-conditioned and heated sun room. This modern home is your gateway between Lake Michigan life or relaxing on your large Trex deck with nature. The home theater is the perfect end to your day or take a relaxing hot tub - both options included. One year home warranty included with purchase price. Hot tub, projection TV (minus audio), dock, washer and dryer, refrigerator, oven, dishwasher and microwave are included. All audio amplifiers and speakers (including in the theater room) are not included in the sale. TV's and mounting hardware (other than the one in the theater room) will be removed and the mounting holes/paint will not be repaired by the seller. All electronics not included in the sale may be purchased as personal property separately from the sale of the real estate. Measurements are estimated based on the combination of public records and rough measurements. Buyer to verify all information provided in the listing. Directions: Lakeshore Drive north of VanBuren Street. Legal: Lengthy legal in listing office. Measurements are estimated based on the combination of public records and rough measurements. Buyer to verify all information provided in the listing. Agent Only Remarks: Current owners has invested over $100K in improvements during their ownership. Improvements include finishing the 4 season room, trex decking and stairs, driveway and landscaping improvements. They also ''finished'' or improved many items that were not completed when it was originally built. Call Sheldon at 616-450-9009 to arrange a personal tour or just to "Ask Sheldon!" a question about these properties, other properties or any other real estate concern.